In this groundbreaking book, Michelle draws from such diverse fields as biology, mythology, energy medicine, and the spiritual traditions. While bravely sharing her own process, she weaves a tapestry both poetic and practical. 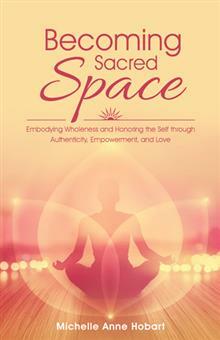 Becoming Sacred Space is a primer to help us realign to our inner truth, reconnect to our deep resources, and bring forth the sustainable and vibrant Selves that our beloved planet needs us to be in this time of transformation. By attuning to the archetypes and integrating their wisdom, we as a species can come back into balance with the greater ecological system. Some of the shifts in understanding of these timeless stories have altered the way the energy manifests. By reconnecting directly to these sources, we can update the Message in its living form within us and our actions in the world will reflect this new, yet never forgotten, truth of our being.